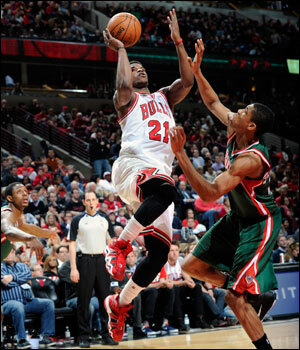 The Bucks stopped here Friday in the Bulls 102-90 victory over Milwaukee. Nah, been used too much. The Bulls passed the Bucks, and outrebounded them and outhustled when as well with 13 steals, equaling a season high they also matched in Atlanta Wednesday. Don’t really like that one, either. The Bulls Bucked the trend of being threatened by losing teams in basically having a double digit lead for almost the entire last 46 minutes, then watching a 22-point fourth quarter lead reduced to eight with 7:11 left until eventually pulling away again. Well, I don’t know. The Bulls got some bang for the Bucks with Jimmy Butler and Kirk Hinrich each with 17 points leading a balanced attack with all seven regulars in double figures. No, not really. Maybe something else. The Bulls tried to Buck the system in the Eastern Conference. But with Toronto, Brooklyn and Washington all winning the Bulls in going to a season best 44-32 remained tied for third with a possible playoff preview in Washington Saturday. Really, I’m almost done. It was big Bucks for the Bulls Friday as Joakim Noah and Carlos Boozer had double-doubles, 14 points, 11 rebounds and five assists for Boozer and 11 points, 13 rebounds and four assists for Noah, as four different Bulls had at least four assists and the Bulls attempted 42 free throws (77 combined) in a slow game in which the United Center crowd to Buck up actually was doing a wave. Oh, heck already. Bulls win, Bulls win. “Every win is not going to be perfect,” said Taj Gibson. “A win in this league whether they’re in last place, first place, every game is tough and a win is a win. The only real look at that the rest of the regular season in six more games comes Saturday in Washington. The Wizards after a good win Friday in New York remain sixth in the Eastern Conference. The Bulls currently are tied with Toronto for third, but Toronto has the tiebreaker by virtue of leading the division. But if the Bulls move ahead of the Raptors they’d likely open the playoffs against the Wizards. The Wizards are the only team in the Eastern Conference the Bulls have not defeated with two January losses not long after the Luol Deng trade. But it’s a different Bulls team since then as that second Wizards game was in Washington and right after a Bulls triple overtime win in Orlando. But since that loss in Washington Jan. 17, the Bulls are 26-12 and have won six of seven. Although they weren’t as sharp Friday against the Bucks shooting 36.9 percent, the Bulls continue to play their best of the season with a determined defensive game even when the offense sputtered some. The Bulls did surpass 100 points against the undermanned Bucks with just eight healthy or not suspended players. They’re 29-2 when they score at least 96 points and 12-1 when their five starters are in double figures like they were against the Bucks. Butler and the Bulls are now 29-2 when they score at least 96 points and 12-1 when their five starters are in double figures like they were against the Bucks. The Bulls did pretty much from the beginning with an overwhelming start, an 18-6 lead less than eight minutes into the game on a Mike Dunleavy ball fake and three and 27-15 at the end of the first quarter on a Butler three. More impressive was the defensive determination as Butler and Kirk Hinrich were all over the Bucks guards, forcing them away from their moves and plays. The Bulls took a 51-35 halftime lead with Gibson throwing down another of his power slams on a Butler pocket pass midway through the quarter that probably was a good reason the Bucks had held the O.J. Mayo back on the bench. The Bulls did so in a big third quarter for Boozer, who was aggressive inside as the Bulls appeared to break it open with an 82-62 lead going into the fourth quarter. There was a bit of shoving when D.J. Augustin appeared to have some sensitivity about being hit in his sensitivities and Khris Middleton got a technical foul. Augustin with 14 points and a team-high six assists made the free throw. The Bucks, with Brandon Knight getting 22 and Jeff Adrien scoring 21 as they thwart the 76ers and chase down the league’s worst record, then put a 15-3 run on the Bulls to make it an 85-77 game with 7:11 left. The wave stopped as the Bulls weren’t surfing through this one anymore. But Hinrich coolly came up with the defensive play of the moment. After Augustin missed a three, Adrian found Ramon Sessions running full court for a layup and what looked like just a six-point deficit with half the quarter remaining. Yes, Yo Ramon, yelled Adrien. But as Sessions gathered in Adrien’s full court pass, Hinrich delivered the knockout, stripping the ball away to stop that Bucks scoring session. 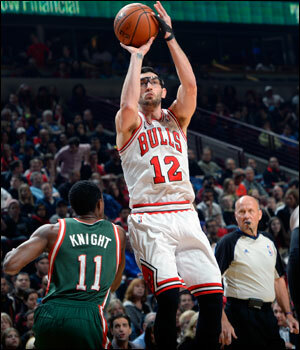 Hinrich got the ball up to Augustin, who passed back to Hinrich open on the right wing for a three and an 88-77 Bulls lead with 5:59 left. That was enough to enable the Bulls to Buck up given the circumstances and with a couple of timely Gibson plays the Bulls didn’t allow a fast Buck to catch them the rest of the way.